Welcome to the fourth part of How to Make Money Writing and Publishing eBooks here on Disease Called Debt! Creating your own ebook is a great way to earn some extra money so that you can pay off your debt faster, increase your savings or just spend on whatever you like! Today’s post will explain how to create an effective marketing strategy so that you can get your eBook sales off to a great start. If you want your eBook to sell, you’ll have to put as much effort in to promote it as you did to write it! Although it’s great to get your eBook on a reputable site like Amazon , the task of getting it in front of readers who actually would like to buy it falls down to you. Getting your eBook sales off the ground requires a lot of promotion just like you would do with any other product or service that you’re offering. Take blogging for example – you could write the most amazing content in the world but if you don’t put your blog posts out there to your social media followers, friends and colleagues, there’s a good chance they won’t get read as much as it should. So eBook promotion is really important when it comes to making money from your eBook. And there are a number of marketing strategies that you can undertake that will really help you to sell your eBook to the right people. Before we come onto those, I just wanted to break away for a moment to cover something else just as critical – eBook reviews. Getting as many positive reviews as you can for your eBook should be high on your list of priorities. If you think about it, would you buy an eBook with no reviews, or more bad reviews than good? Probably not, right? eBooks that sell have a high number of positive reviews. Have a look at the Amazon Kindle Bestsellers List to see what I mean. A high number of positive reviews instills confidence in potential buyers and they’re more likely to make a split decision to purchase your eBook if they can see that others have already bought it and liked it. So before you promote the hell out of your eBook, try to actively get some reviews for your eBook first. There are a few ways you can do this. One way is to ask your friends and family to buy your eBook and leave an honest review for you to get you started. If you have a blog, website or are well connected on social media, you can ask your readers and social media followers outright to read your eBook and leave a review. Be prepared to gift your eBook to them! Another way is to see if you can do a review exchange with a fellow author by gifting them your eBook and vice versa. There are some Facebook groups that you can join such as Authors and Reviewers, where you can do exactly this. Every author wants and needs reviews so you’ll find this strategy very effective. Be careful of fake reviews – what you don’t want is crappy reviews from people who haven’t actually read your ebook. Not only does this look bad but Amazon don’t take kindly to fake reviews. So if you decide to go down this route, keep it ethical! You can of course wait for organic reviews to appear. But this can take a very long time, so if you want to start selling eBooks straightaway, it’s worth making an effort to get some right from the start. Now, back to promoting your eBook! If you have a blog or website, let your readers know in advance that you’re going to be launching an eBook and get them to sign up early for an alert about it. When your eBook is published on Amazon, create a specific page for your eBook and send out an email campaign to let interested parties know about it. At the same time, make sure you’re promoting on social media before the launch, during and after! There are Facebook groups for just about every topic and niche imaginable. So join some groups that are relevant to the topic of your book and post a snippet about your eBook once it’s published. There are also Facebook groups dedicated to promoting eBooks such as Amazon Kindle Promotion. You can post a message about your eBook in these groups too. There are tons of eBook promotors that will retweet you if you send them a tweet (not message) about your eBook. All you need to do is follow them – they don’t even need to be following you. Just type in “promote eBook” in the Twitter search bar and you’ll see lots of similar accounts! When promoting your eBook on Facebook and Twitter, keep your messages short but exciting. State the title of the eBook and why people should read it. Make sure to add a direct link to your eBook on Amazon in your tweets / posts! As well as promoting your eBook on social media, there are many websites set up just for the purpose of promoting authors. Here are 9 free sites you can promote your eBook on for starters. Sites like this require a little information from you about your eBook in the form of a directory submission. Another good way to promote your eBook is by guest posting on blogs and websites that are relevant to your eBook’s topic. You don’t need to have a blog yourself to do this but it helps to have a few connections with bloggers so that you can approach them when the time is right. You can write an article about your eBook and why you think people should read it along with a link to your eBook on Amazon. Many bloggers are open to receiving guest posts as long as they are high quality and aren’t spammy in any way! I hope you found this post about how to promote your eBook helpful. If you did, please take a moment to share this post with your followers on social media. 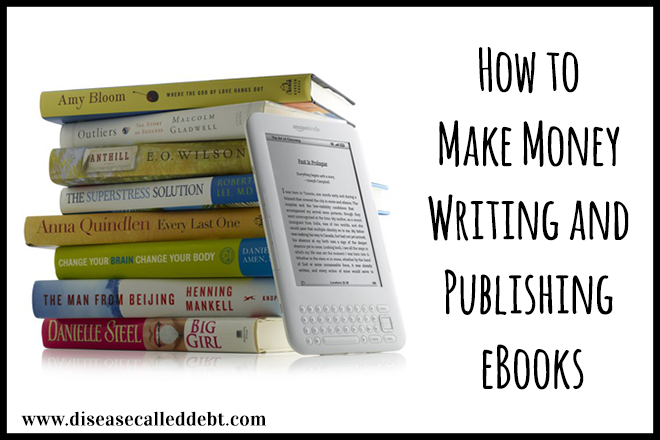 Now for the final part in this series – how much money you can make by writing and publishing your own eBook! Head on over and check it out! I think the promoting of the book is probably THE most important task when writing any book. I’m finding out how hard promoting is with my crowdfunding campaign! But people need to be reminded “it’s” out there! Tonya@Budget and the Beach recently posted…Could You Live Off the Grid? Definitely Tonya! I think what you’re doing with the crowdfunding campaign for your videos is brilliant by the way! That’s a good list of twitter accounts to follow. Thanks for sharing it with us Hayley. Thank you for this series, I am very inspired to make some extra income with a book. Do you think I can need a blog to sell an ebook successfully? I am thinking 2 genres, self help and mysteries which are so different! Thank you!!! Hi Fabienne, I’m glad you found this series helpful. Yes, a blog does help, but only if you can get traffic to your blog in the first place! But it is possible to make money from eBooks without a blog. Good luck!